Ralph Lauren has launched Polo Blue Gold Blend, a new fragrance for men. Polo Blue Gold Blend is a flanker to 2002's Polo Blue. Additional notes include grapefruit, lavender, pepper, green apple, cardamom, patchouli and amber. 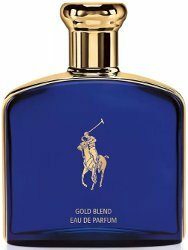 Ralph Lauren Polo Blue Gold Blend is available at Bloomingdales, in 125 ml Eau de Parfum, $98.